GREEN BAY, Wis. (CNS) — Praying the Stations of the Cross is a popular Lenten activity for Catholics, but for those who are deaf or hard of hearing, it can be a difficult, sometimes impossible challenge to follow along with the story of Jesus’ passion. 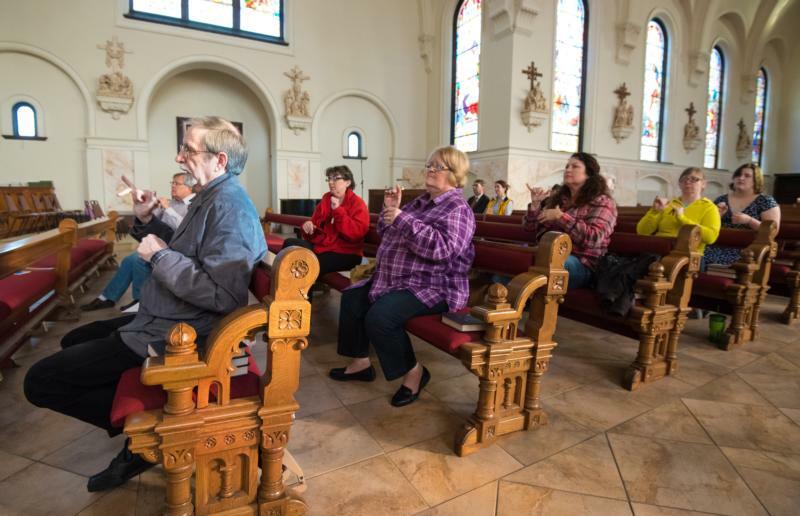 About 10 years ago, the deaf community in the Diocese of Green Bay began holding “Deaf Stations of the Cross” at St. John the Evangelist Church in Green Bay. Using American Sign Language, community members take turns presenting the meditations and prayers that make up the stations. This year, they used a booklet that offered Mary’s perspective of Jesus’ journey to the cross, according to Jean Laux, director for Deaf Ministry at St. John the Evangelist Parish. About 20 people turned out for the Deaf Stations of the Cross March 11. Images of each station were projected onto a screen in the church sanctuary. “We do not move from station to station because it is too hard to see the person signing,” explained Laux, who is deaf. “We need to have a clear sight line.” The stations also are voice interpreted for people who do not know American Sign Language. The “Deaf Stations of the Cross” are held only once during Lent, said Laux, because people travel long distances to attend.